← Barbecue Bacon Grilled Cheese Sandwich & Giveaway Winner! I have several magazine subscriptions and the ones that aren’t entirely devoted to food and recipes do include recipes and by the time I’ve gone through them, they are inevitably bristling with pieces of paper I’ve used to mark those I want to try and never do. Every once in a while, however, a recipe jumps out at me and I can’t stop thinking about it until it has been made. Enter the May edition of Everyday Food. As soon as I saw these fish tacos on the cover, my heart began to sing. They were so colorful and seemed a perfect spring/summer meal. I had to make them. I mostly followed the recipe except I did something a little different with the sour cream, using a recipe from my friend, Kitty, whom I owe a sincere thanks to. It is the closest thing she’s found to the cream they serve on fish tacos in Baja California and while I wouldn’t have a clue as to whether it tasted the same or not since I’ve never been to California, I can attest that it is delicious on these tacos! From start to finish, this meal was on the table in fifteen minutes. So easy! So simple! So gorgeous! So light! So delicious! I often forgo simple recipes like this, believing that the more time and effort and ingredients that is involved makes the end product that much better. As this recipe proves, that’s not always the case. Heat broiler, with rack in highest position. Pat fish dry with paper towels and gently coat with oil on a rimmed baking sheet. Season with salt and pepper. Broil until fish is browned on top and flesh is opaque throughout, 5 minutes. Meanwhile, mix the Baja Cream ingredients together and set aside. Toast corn tortillas over a kitchen burner using tongs or wrap a stack of 6 at a time in damp paper towels and heat in the microwave for 40 seconds to 1 minute. 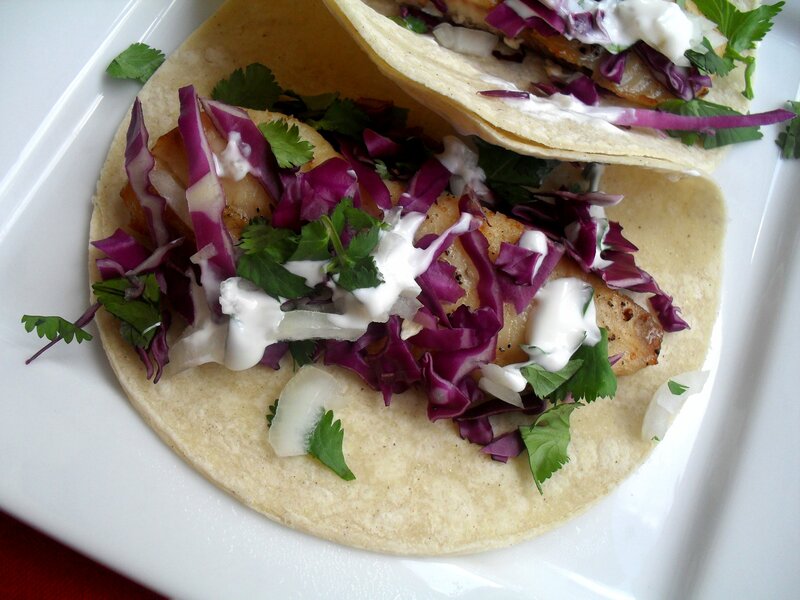 Divide fish evenly among tortillas and top with cabbage, cilantro, and onion. Serve with Baja cream and lime wedges. SERVES 4. 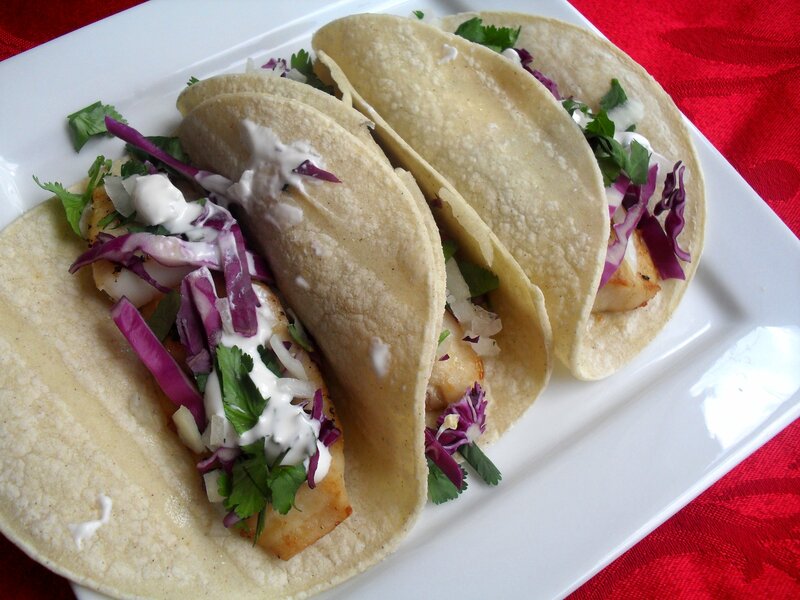 Posted in Lighter Fare, Main Dishes, Mexican, Seafood and tagged baja cream, cabbage, cilantro, easy, fast, fish tacos, healthy, lime, quick, recipe. Bookmark the permalink. Oh wow. They sound wonderful!! I wonder why I have not yet made fish tacos….would be an explosion in my mouth! And that baja cream! Swoon! I’m surprised you haven’t! They are a great emergency meal since they take hardly any time to prepare. These look delicious. I’ve been having fish tacos on my mind for a few days now and this recipe looks perfect! we are on the same page – i just posted about fish tacos yesterday! :) Baja Cream sounds amazing! It must be the season or something b/c last night I was chatting with a friend that mentioned he was making fish tacos for dinner tomorrow! We’ve got ’em on the brain! I’ve never made fish tacos…I’m missing out! :) I just bought fish yesterday and it’s not earmarked for any particular recipe…I think I need to make these tacos! Knowing your creativity in the kitchen, you’ll put your own spin on it and another “meal in minutes” will be born! Oh we love fish tacos. I do “morph” my left over fish,e.g baked fish and turn them into tacos. The baja sauce that i make calls for jalapeno for a kick. Yours sounds good too. You are one smart cookie! I bet using fish that has different flavors on it from different meals would make really yummy fish tacos. This is yum, and that sandwich below is yum and yum and yum and I can’t be hungry this late at night what are you doing TO ME????? That’s what you get for posting guacamole yesterday–I’m still drooling just thinking about it! Another reason why I like you – another magazine whore! OMG, this months Bon Appetit is insane! So many good recipes! Do you subscribe to that one? Haha-you know it! But I’m backlogged and haven’t even read last month’s Bon Appetit. Since you’re enthused about this month’s, I’ll go through that one first. Now I’m excited! I know the cover struck me–I think it was a salad?–so I’m sure I’ll find a lot to make in there as well. These look so delicious and perfect for a crisp spring day! I love fish tacos. Your baja sounds like the perfect accompaniment! That’s funny you mentioned frozen fish filets b/c I’m making these again today with, gues what? Frozen fish filets! Yours will be good but sound a little bland without the kick of lime. Unless you have something against lime, you should try squeezing a little onto one bite to see if you like it. And you are a gringo heathen for using lettuce in place of cabbage, just so you know! I think that would get you stoned in CA–lol. I really like your idea on the french fried onions–that will help the flavor a lot. And yes, tomatoes are perfect–I’ve used them before along with cheeese–yum! I’m just giving you a hard time–I’m sure they’ll be fabulous!